In my previous post, I discussed how it takes a lot to compare and stack rank employees, and really the best you can do is to come up with some limited scenarios where you compare similar jobs, with clear rules, consistent evaluators and transparency. With that done, you now have determined the winner in a limited context in a given time frame. So it doesn’t really tell you who is the “best”, but who was the best in that context. If that context comes up a lot, then you can get trends and be more predictive, such as the case in answering “who is the best athlete,” but still leaves a lot open for debate. In the contemporary workplace, these conditions happen less and less. In the contemporary workplace, employees are asked to adapt to constantly shifting situations, new technologies, new projects, and new skill sets. Instead of who is the “best” at something, it is the who is the “best” at adapting to new situations, which can go in many different directions. You need people who are great in different facets of the work, and who can adapt and improve and strive toward meeting the organizational goals. This makes it very unlikely that you can have some sort of conclusion who is the “best” and who is “on top”, since there is a diversity of skill sets needed to achieve these goals, and they are often shifting. So instead of “stack ranking” employees, which implies that one employee is inherently better than another (and makes a not-so-subtle argument that it is forever that way), managers need to strategically place employees in roles and projects based on what the managers and employees assess they are good at and their ability to execute. It’s less about who’s the best, and more about what is the best placement to get the work done. Let’s take a look at the What/How grid to be as a way to be more strategic with a team’s strengths. This grid shows an analysis by a manager of a fictional team, based on “what” the team member produces and “how” they work with others. Other analyses could be performed based on your organizational needs. I’d put Harry in a role that requires relationships to be forged. I’d make sure I’d give Harry some expectations for what we are looking to get out of those relationships (new leads? sales? higher customer satisfaction? socializing a new program across groups?) and rate him against these expectations. I’d put Jill in a role that is not customer-facing but requires a lot of work output where relationships are less crucial for success, and rate her against what she produces (and diminishing the importance of “how” she produces). Ideally, this most likely feeds to Harry information that makes him better. If I need more customer-facing work and relationship building, I’d put Elizabeth on that, and if I need more work output, I’d put Thomas and Elizabeth at that. 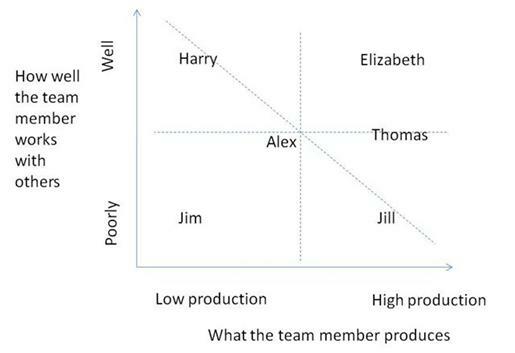 Elizabeth and Thomas are more flexible, which obviously has value, but if the value of customer relationship building is super-important for the team, then perhaps Harry is more valuable than Thomas for now. It isn’t a permanent thing, but a thing that is based on the context of the team’s needs, and not on the context of the employees inherent abilities. With Alex, I would try to figure out where Alex is most likely to be needed in the near future, and work on giving performance feedback and coaching in the direction where your team is likely to need it. Perhaps Alex can be a back-up to Harry in the follow-up with customers. With Jim, he rates lowly in two dimensions, which looks like a net-negative to the team, so I would look at the performance management process for him, because it doesn’t look like he’s helping the team at all, and unless he improves (which is entirely possible with the performance management process) there is likely someone else out there who could do his job better. So instead of saying, “Elizabeth and Thomas” are the most important employees, the manager should first focus on trying to maximize where all employees can most help the team to achieve its goals. This treats all employees as valuable, and is likelier to achieve overall team performance. This is where the management energy should be spent first and foremost. The shifting dynamics of the team context should be the greater concern, not the ranking of individual employees against one another, since you need the entire team to perform to be successful. Also note that once placed on this grid, the people are not permanently located there. Any one of them can shift around based on changing circumstances, work stresses and pressures, and individual development. In this article, I use a very simple “What/How” grid to identify the strengths of the team and to assist with illustrating how a manager can use this simple tool. Another common method is to use the Strength Finder tool from the book Now, Discover Your Strengths , which has many more dimensions and areas of insights and one I would highly recommend any manager do to identify the areas of strengths on the team and then make strategic decisions accordingly. How much energy does your management team spend in strategically utilizing employee strengths? How does this compare to the amount of time ranking employees?